Reading and share top 18 famous quotes and sayings about Doors And Windows by famous authors and people. Browse top 18 famous quotes and sayings about Doors And Windows by most favorite authors. 1. "But fear doesn't need doors and windows. It works from the inside." 2. "The air was so damp that fish could have come in through doors and swum out the windows, floating through the atmosphere in the rooms. One morning Ursula woke up feeling that she was reaching her end in a placid swoon and she had already asked them to take her to Father Antonio Isabel, when Santa Sofia de la Piedad discovered that her back was paved with leeches. She took them off one by one, crushing them with a firebrand before they bled her to death." 3. 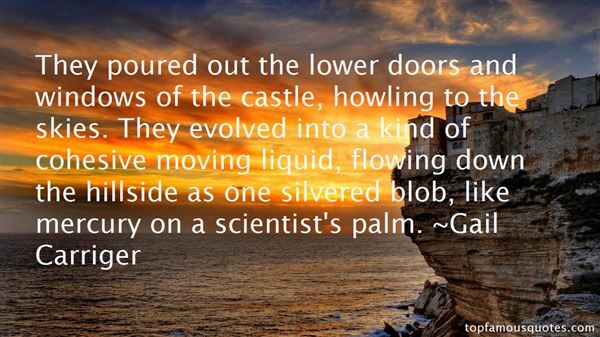 "They poured out the lower doors and windows of the castle, howling to the skies. They evolved into a kind of cohesive moving liquid, flowing down the hillside as one silvered blob, like mercury on a scientist's palm." 4. 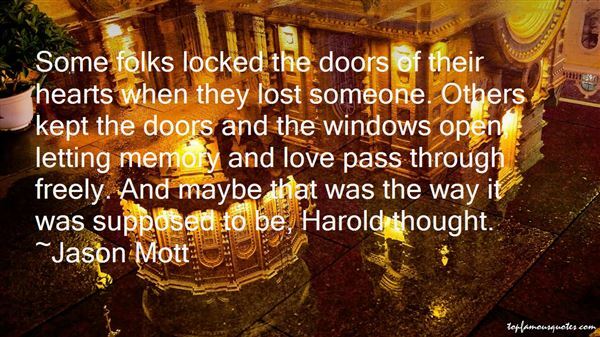 "Some folks locked the doors of their hearts when they lost someone. Others kept the doors and the windows open, letting memory and love pass through freely. And maybe that was the way it was supposed to be, Harold thought." 5. "Sometimes Josie thought of her life as a room with no doors and no windows. It was a sumptuousroom, sure-a room half the kids in Sterling High would have given their right arm to enter-but itwas also a room from which there really wasn't an escape. Either Josie was someone she didn'twant to be, or she was someone who nobody wanted." 6. "Shape clay into a vessel;?It is the space within that makes it useful. ?Cut doors and windows for a room;?It is the holes which make it useful. ?Therefore benefit comes from what is there;?Usefulness from what is not there." 7. "In the country neighbor­hood thereabouts, along the dusty roads, one found at intervals the prettiest little cottage homes, snug and cozy, and so cobwebbed with vines snowed thick with roses that the doors and windows were wholly hidden from sight-sign that these were deserted homes, forsaken years ago by defeated and disap­pointed families who could neither sell them nor give them away." 8. "Maybe we can hold the windows and doors," Mars said doubtfully. The ruined building was little more than a shell, with no roof and gaping empty rectangles for windows. "But if they charge us …" "They're charging!" Hel shouted." 9. "... she had insisted on keeping the doors and windows shut, as if a sealed chamber could prevent death from entering, or life from leaving her." 10. "SENSE OF SOMETHING COMING: I am like a flag in the center of open space.I sense ahead the wind which is coming, and must liveit through.while the things of the world still do not move:the doors still close softly, and the chimneys are fullof silence,the windows do not rattle yet, and the dust still lies down.I already know the storm, and I am troubled as the sea.I leap out, and fall back,and throw myself out, and am absolutely alonein the great storm." 11. "Nothing of the kind; they do all these things in their houses and sheds, with common charcoal fires, and a quantity of straw to stop up the crevices in the doors and windows." 12. 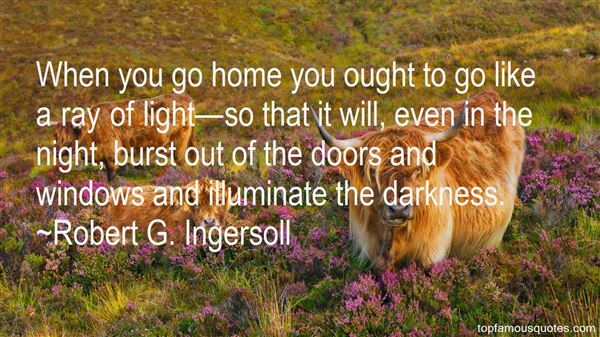 "When you go home you ought to go like a ray of light—so that it will, even in the night, burst out of the doors and windows and illuminate the darkness." 13. "Rumour is information distilled so finely that it can filter through anything. It does not need doors and windows -- sometimes it does not need people. It can exist free and wild, running from ear to ear without ever touching lips." 14. "In his original design the solicitor's clerk seemed to have forgotten the need for a staircase to link both the floors, and what he had provided had the appearance of an afterthought. Doorways had been punched in the eastern wall and a rough wooden staircase - heavy planks on an uneven frame with one warped unpainted banister, the whole covered with a sloping roof of corrugated iron - hung precariously at the back of the house, in striking contrast with the white-pointed brickwork of the front, the white woodwork and the frosted glass of doors and windows. For this house Mr.Biswas had paid five thousand five hundred dollars." 15. "Going about one's native land one is inclined to take many things for granted, roads and buildings, roofs, windows and doorways, the walls that shelter strangers, the house one has never entered, trees which are like other trees, pavements which are no more than cobblestones. But when we are distant from them we find that those things have become dear to us, a street, trees and roofs, blank walls, doors and windows; we have entered those houses without knowing it, we have left something of our heart in the very stonework. Those places we no longer see, perhaps will never see again but still remember, have acquired and aching charm; they return to us with the melancholy of ghosts, a hallowed vision and as it were the true face of France. We love and evoke them such as they were; and such as to us they still are, we cling to them and will not have them altered, for the face of our country is our mother's face." 16. "So [Steve Jobs] had the Pixar building designed to promote encounters and unplanned collaborations ... "to make people get out of their offices and mingle in the central atrium with people they might not otherwise see." The front doors and main stairs and corridors all led to the atrium, the cafe and the mailboxes were there, the conference rooms had windows that looked out onto it, and the six-hundred-seat theater and two smaller screening rooms all spilled into it. "Steve's theory worked from day one, "Lasseter recalled. "I kept running into people I hadn't seen for months. I've never seen a building that promoted collaboration and creativity as well as this one." 17. "And she withdraws through the double, ceiling-high doors, which are really the only original feature left in this heavily converted apartment. And isn't the same true of me? All that was once me has been dispersed through the flux of a thousand thousand experiences. The 'I' has been partitioned off, remodelled, resurfaced and re-insulated, so that it cannot even remember what the original dados or mouldings were like. They say ninety per cent of house dust is dead human skin – and that's me. Dust on a windowsill, in a converted apartment, in a foreign city." 18. "But what I remember is the countryside then, the brilliance of outdoors and outwindows, and the sunlight streaming through the lozenge shapes of the glass, and we were locked away from it, locked inside to worship. And there was the sun out there for everyone else to see. Good God, tell me Clovis wasn't lonely at dawn. Tell me he wasn't sick at the sunset." Grammar to a writer is to a mountaineer a good pair of hiking boots or, more precisely, to a deep-sea diver an oxygen tank."